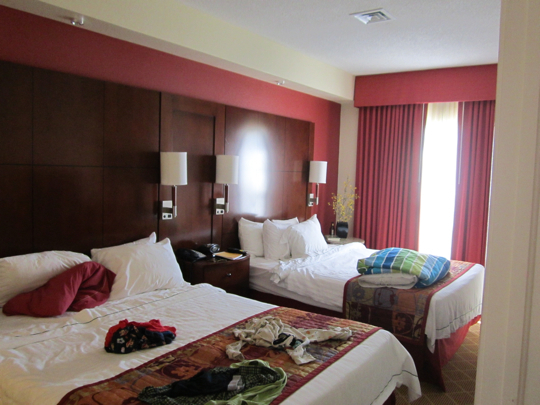 When we went to Kansas City we Pricelined a hotel room as we always do. 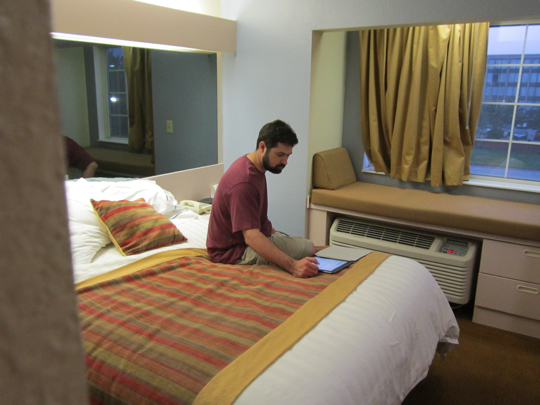 We don’t really care where we stay, although many times we get a very nice hotel room for a surprisingly low rate. This time we got a room in a Microtel. I was actually excited, because I stayed at the Microtel before and will love them. They are tiny! If you are doing a Google search for ‘how big is a Microtel hotel room?’, then this is it. The room is very small. Imagine a regular hotel room, but where where the second bed would be? Chop it off and put the wall there, but with a nice window seat. The window seat really could function as another bed and of course I had to try it out. Squeee! So tiny! My point is that this room was a very small room and I loved it. Now our hotel room we only use for sleeping and watching television. Now let me show you the Kollipara’s room in a Residence Inn. They are a family of five with six active boys and were having a vacation so their needs were different. 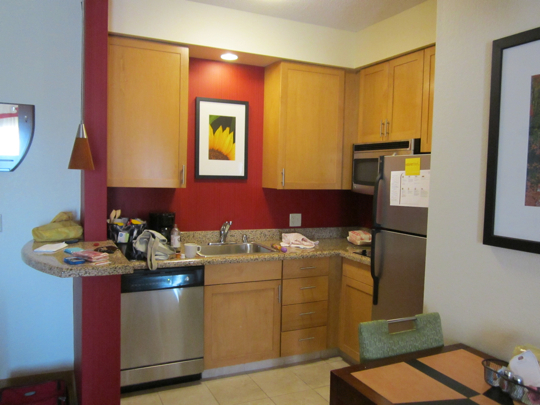 They had a very nice suite with a kitchen, dining area, wonderful living room that had an extra (pull-out) bed and a separate bedroom. Hmmmmm, I used to love my Microtel room. Was there room in Kollipara’s suite to hang out and dine with them? Cute room! 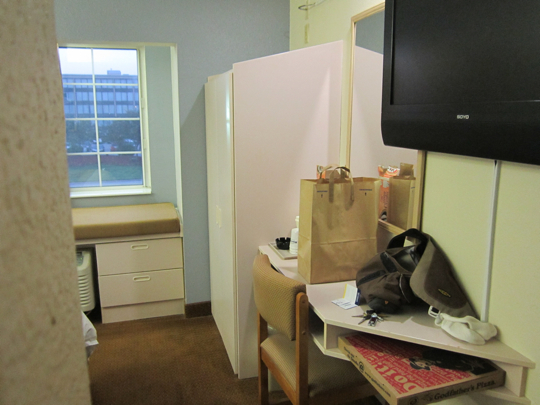 It reminds me of a hopsital room…..I’ve sat in s similar window seat too many times to count. I’m at your house and you’re not here. I was thinking you were still in Kansas City or something, but Beth helped me get up to speed. Dumb question: The Kollipara’s are a family of five with six active boys? How can that be? I’m either really tired and am missing something funny, or just too dumb to pick it up. No prob. Was just confused. How comfortable are the beds in a Microtel? I thought it was quite comfortable, but then again, we had just pulled wire for 8 hours and driven for 3 1/2, so a rock would have been comfortable to me.